LONDON—06 September 2017— We are proud to announce that Westcon-Comstor, as a leading value-added global distributor of security, unified communications, network infrastructure and data center, have been appointed to distribute the Microsoft Surface Hub. Westcon-Comstor offers 30 years of industry expertise in helping Value Added Resellers (VARs) deploy complex AV solutions and unified communications systems. With our global scale, the Westcon-Comstor Unified Communications and Collaboration Solutions Practice will make it easier for VARs to integrate Microsoft Surface Hubs and Surface Hub accessories into their customers’ collaborative environments, as well as the opportunity to provide additional services such as site assessments, solution design, project implementation and service support. The Surface Hub, which is available with a 55-inch or 84-inch screen, is designed for collaboration, and enables multiple people to work on the device at the same time in a range of Windows 10 applications. With digital inking capabilities, each Surface Hub comes with two Surface Pens that enable users to write directly onto the screen. Integration with Microsoft services such as Skype for Business means people can work together remotely and easily share what they create in different ways, including email, OneNote or OneDrive. According to a report by Forrester, for an average 1 hour meeting, an additional 20 minutes is spent on post-meeting tasks, such as typing up notes, taking pictures of whiteboards, recreating sketches and mock-ups in digital format, or writing up text explanations to accompany pictures. 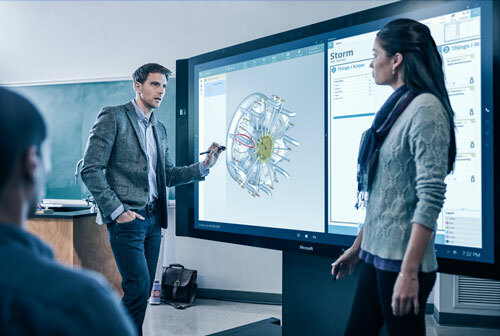 Purpose built collaboration solutions such as the Surface Hub help reduce and in some cases eliminate this post meeting work by providing a digital experience that everyone can contribute to and access after the meeting ends. This ultimately helps companies increase productivity and decrease common barriers to collaboration. Today, over half of Fortune 100 companies have purchased Surface Hubs to improve how their teams inspire and collaborate, breaking down barriers and creating real business value. The UCC Practice helps VARs and vendors grow their business with training programmes, business-extending lifecycle and professional services, and future-forward enablement tools. Westcon-Comstor maintains a strong portfolio of technology-leading and emerging vendors, providing the programmes and incentives that partners need to connect, create and evolve.